Speed Circuit is among the most stable group of players at WBC with only 20 players claiming 48 laurelist places. 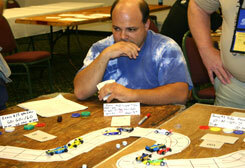 John Sharp III ponders whether he should make his move at the next corner. He was among the leaders again this year. 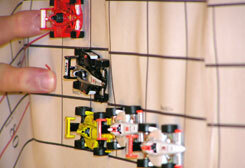 The race games with their scale model cars are among the most photogenic and tactile events at WBC. Boys love toys! 33 drivers took on three different quaifying tracks seeking entry to the semi-finals. Long Beach, Nurbergring, and Monza challenged players with different track styles and produced a diverse set of semi-finalists. All six qualifying races were won by different drivers -- Kevin Keller, Jim Fleckenstein, Dennis Nicholson, Doug Galaullo, Terry Schulz, and Scott Cornett -- and five more drivers qualified with second place finishes. Twenty drivers qualified for a run at Montjuich and the ten spots in the Final. 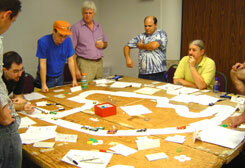 Terry and Doug won their respective tracks and dramatic moments in the final corner of both races decided the eight drivers who would provide the competition in the Final. Six previous Speed Circuit champions toed the line for the start of Vitesse Jean-Behra trying to be the first ever to claim a second title. Terry outbid fellow semi-final winner Doug for the pole and broke out to an early lead. 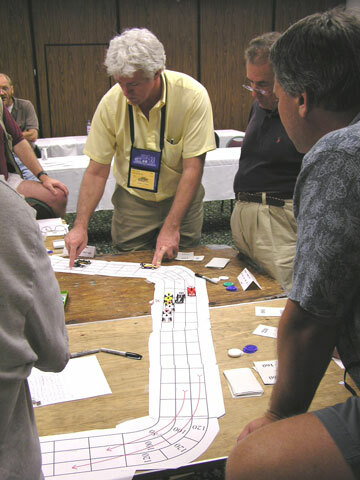 However, Doug would soon regain the advanrtage and hold a one-space lead as the second lap began. Corner 7 of lap 2 witnessed the most discussed move of the race as Doug slowed going into the corner to block Terry from exiting cleanly. Terry attempted a forced pass to move into the lead but was blocked and stranded in the corner. Terry was immediately passed by three cars and broke his acceleration on the very next turn -- leading to his retirement. The last lap began with Doug nearly a full turn ahead of the pack. But Kevin Keller spent seven wear in four corners over three consecutive turns to pull along side coming out of corner 7, setting up a side-by-side duel with Doug for the championship. Kevin's failure to push his top speed and Doug's success pushing his acceleration kept both drivers even going down the back straight. Doug kept pushing his car, exceeding his top speed to gain the initiative over Kevin then used his last wear and a brakes test to stay safely out of corner 8. Running out of options, Kevin made a naked chance in corner 8 followed by a test brakes prior to a second naked chance in the last corner to claim the lead. Doug, seeing his shot at a championship slipping away, attempted a naked chance of his own in the final corner that resulted in a crash. Kevin walked away as the first holder of two Speed Circuit. titles in a very exclsuive club as he was followed across the finish line by five other returning laurelists. Last year's top six had reclaimed all the laurels again this year - merely reshuffling the top spots ... the first time in memory that had happened for any WBC event.